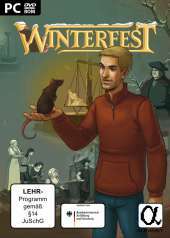 This German learning adventure game was developed for adult learners in basic education and is suitable for both coursework and individual learning. An exciting story, attractive graphics, varied tasks, entertaining mini-games and exciting puzzles motivate the players to train and consolidate their reading, writing and computing skills in connection with everyday and professional situations. To the game: Alex, the hero of the story, lives together with his mother in a small house. When a letter from the bank threatens the eviction of the house, he faints. He comes to himself again - but not in the home, but in a medieval city. Help the stranded Alex together with a small talking rat to come back home. Through various tasks, your character's ability to read documents or calculate small tasks grows. Various people who appear during the game are at your side to help you. But beware of the shopkeeper, because this person is up to something. Slip into Alex's role and experience an exciting story with exciting puzzles. Immerse yourself in the colorful world of a foreign city and train your reading, writing and computational skills in various everyday and professional situations. It was developed as part of the Alphabit project and was funded by the Federal Ministry of Education and Research from November 2007 to October 2010 within the priority area "Literacy / Basic Education for Adults". In the first year of its availability, it was downloaded 4,000 times from the Internet. In addition, several thousand copies of the CD were sent. 90,000 CDs were also distributed as an insert in a computer magazine "Chip".